The temporary pavilion designed by SelgasCano Architects will host the events of the Martell Foundation until the summer of 2018, when the first section of their building, currently being renovated, will be inaugurated. UNFINISHED, the Spanish Pavilion exhibition curated by Iñaqui Carnicero and Carlo Quintáns that won the Golden Lion award at the 15th International Architecture Exhibition – La Biennale di Venezia is now on show in Australia as part of the “40 Days of Spanish Architecture in Australia” initiative. 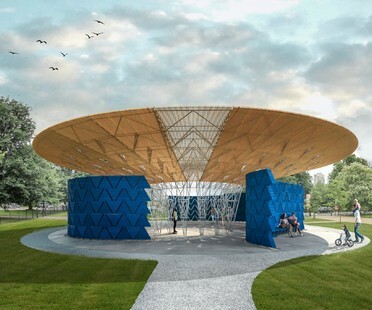 Spring is at the door, and a number of international institutions have announced the results of design competitions for temporary summer structures: pavilions and installations to host summer events and programmes. Combining the contemporary needs of a rapidly developing country like Cambodia with the themes of sustainable architecture - and more importantly locally sourcing material and labour- is one of the points of the Bamboo Landmark Design Challenge promoted by the Building Trust International NGO. Following the appointment of architects Yvonne Farrell and Shelley McNamara as curators of the 16th International Architecture Exhibition, coming up in Venice in 2018, we look back at the pages Floornature dedicated to the 2016 edition.